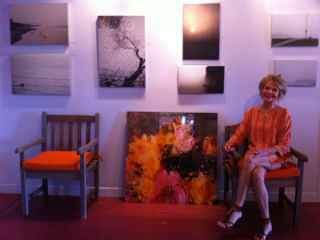 We met Kathleen Gerdon Archer at her White Bird Gallery outside of Boston in an artist’s community this summer. I was dawdling behind my husband at some other galleries and he cam rushing back to get me exclaiming that he found something that he thought I would really like. He was absolutely right. “Using the element of water, I tell a story that begins with water-filled abstract images which over time become clearer and end with subjects who are clearly visible, but enveloped in a light fog. My intention is to obscure the line between painting and photography while documenting a change in my recent family history. These are both large and small scale works. I particularly love the large ones. These are beautifully executed and you can see stories in the womens’ eyes. Please check out more of these “choices” on herwebsite. Thank you for being such a gracious lady Kathleen!